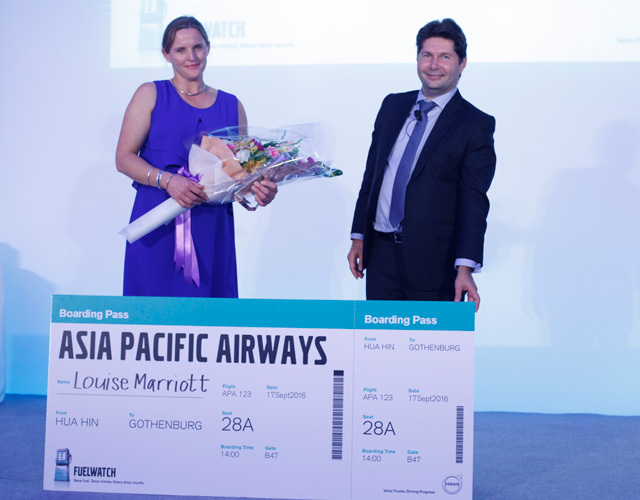 Louise Marriott became the first female driver to be named as Asia Pacific’s most fuel-efficient driver at the Volvo Trucks Fuelwatch Challenge in Thailand last week. MTD & Volvo Truck’s competition run bi-annually in New Zealand, is a recognised global event in the industry, embodies the company’s Fuelwatch mission towards a fuel-efficient industry model. Louise, a driver for JPM Holdings in Christchurch, was one of four female entrants. The other three were from being from China, Thailand & Korea, expanding number of female drivers on a global scale. 17 drivers from 10 countries qualified to contest for the Asia Pacific Fuelwatch Challenge title, with Louise winning the on-road title. Also included in the mix was fellow Kiwi, Phil Thomas from Regal Haulage in Hamilton to take out a top prize in the New Zealand competition. Phil was placed third in Thailand. Which is a great result for New Zealand drivers. During the two day event, participants attended a one-day training session on fuel-efficient driving techniques and technical expertise, followed by the Asia Pacific Fuelwatch Challenge grand finals on the second day.To win the title of most fuel-efficient driver in the on-road category, Louise clocked 17.5% less fuel compared to the highest amount of fuel burnt at the event. Volvo says that within the industry, fuel can account to up to 50 per cent of the operating costs of a typical haulage business. Based on the fuel-efficiency margins recorded in the on-road and off-road finals, this would inarguably translate into significant cost savings potential in a real-world context.